NHM Gadchiroli Notification is out. NHM Gadchiroli is recruiting for 467 Community Health Officer Govt Job Posts. You can check NHM Gadchiroli - National Health Misison last date, download NHM Gadchiroli notification, visit NHM Gadchiroli official website and check other NHM Gadchiroli Vacancy details.Complete Vacancy and recruitment Details about 467 Community Health Officer Govt Job vacancies in NHM Gadchiroli are provided below by JobSarkari.Com only for you. Last Date for Receipt of Application Form. 23/02/2019. Community Health Officer Candidate Must Have Passed BAMS. 467. Maximum Age for UR 38 Years. Maximum Age for Reserved Category 43 Years. District Health Officer, Health Department, Zilla Parishad, Gadchiroli On or Before 23rd February 2019. Q. What is the Last Date For NHM Gadchiroli Community Health Officer Govt Job Vacancy ? A. 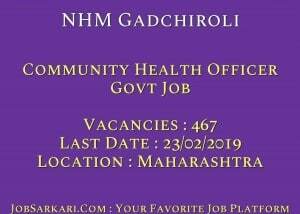 Last Date for NHM Gadchiroli Community Health Officer Govt Job Posts is 23/02/2019. Q. 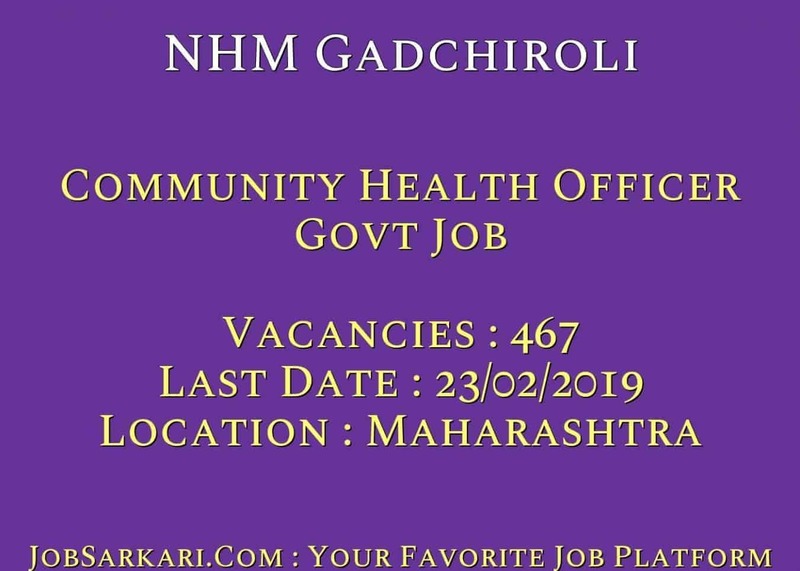 What is the Form Type of NHM Gadchiroli Community Health Officer Govt Job Recruitment ? A. The Form Type for NHM Gadchiroli Community Health Officer Govt Job Posts is Offline. Q. How many vacancies are available in National Health Misison Community Health Officer Govt Job Posts ? A. There are about 467 Vacancies in National Health Misison Community Health Officer Govt Job Posts. Q. What is the Full Form of NHM Gadchiroli ? A. Full Form of NHM Gadchiroli is National Health Misison . Candidate Must Have Passed BAMS..